(Last Updated : 08.03.19). 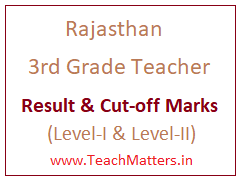 Rajasthan 3rd Grade Teacher Result 2019 : Check 3rd Grade Teacher Recruitment 2018 Result & Cut Off Marks & Raj Panchayat 3rd Grade Teacher 2013 Revised Result 2017 Cut-off Marks - Elementary Education, Rajasthan declared Revised Result and Cut-off Marks of 3rd Grade Teacher Exam 2018 for Level-2 & I. Before this, Rural Development and Panchayat Department (Panchayti Raj), Rajasthan declared Revised Result of 3rd Grade Teacher Exam 2013 for Level-I and Level-II. The result is available at the official website of Panchayti Raj Dept. i.e. www.rajpanchayat.rajasthan.gov.in and www.examtgt.rajasthan.gov.in and www.education.rajasthan.gov.in. Candidates can check now latest result here. Check Elementary Education Rajasthan Panchayati Raj 3rd Grade Teacher 2013 & 2016 Revised Result 2018 REET Cut-off Marks List and Admit Card for Level-I and Level-II. Latest and revised result for direct recruitment of 3rd Grade Teachers 2016-2017-2018 is available here. Candidates can download Level-I and Level-II Revised Result 2018 for 3rd Grade Teacher (Primary & Upper Primary) Direct Recruitment 2016 (revised) 2017 & 2018. 3rd Grade Teacher Latest Result News Updates 08.03.2019 : 3rd Grade 2018 level-2 District Allotment List after Revised Result 2019 has been declared on 08.03.2019 on the official website. REET Level-2 Result was released on 31.07.2018 for Direct Recruitment 2018. Level-1 Cut-off and Selected Candidates List of 3rd Teacher for TSP Area for document verification was released on 01.06.2018 for Direct Recruitment 2018. 3rd Grade Teacher (TGT) 2016 (Revised) Result 2018 for Level-2 & Level-1 - Elementary Education, Rajasthan has declared Result and Cut-off Marks of 3rd Grade Teacher Recruitment 2016 (Revised) for Level-2 TSP for TGT English, Science/Maths & Special Teacher. List of provisional selected candidates for District Allotment & Document Verification has been announced separately on the official website i.e. www.education.rajasthan.gov.in/elementary. Latest and revised result for direct recruitment of 3rd Grade Teachers Competitive Examination 2013 is available here. Candidates can download Level-I and Level-II Revised Result 2017. Note : Cut-off Marks List of other Districts with Download Link is updated here on 24.08.2017. Get Filled Application Form with Application ID or Token No. & D.O.B or Mobile No. Admit card link is given above. Download your admit card now. You can download admit card without Application ID. Link is given above. But you should have Token No. sir please provide varification date dholpur district. Latest Cut-off (August 2017) of 3rd Grade Teacher 2013 has been declared on 24.08.2017. Uper diye link se admit card download kar sakte hain. Online portal is working, click the link or you can download the admit card whose link is given above. Dear, Sir how to got my roll number. I have my Application No. But i Am not have my roll no. please tell me about that. Admit card link is given above. It is active. You can download the admit card now.